The Serbian spruce is one of two spruces native to Europe. It is endemic to a small area within Bosnia and Herzegovina and neighbouring Serbia in the Balkan Peninsula. Tree to 30m tall, d.b.h 0.8–1m; bark rough, with papery flakes, reddish brown. Branches curved down or pendent and reaching the ground; crown very narrowly conical or columnar. Leaves radially spreading and then flatter and parted, lower leaves spreading to almost 90° from shoot, 10–20 x 1.5–2.2mm, linear, flattened, keeled on both sides; apex obtuse, stomata in two greenish white bands of 4–6 lines on lower surface, upper surface glossy green. A very distinctive species that has in the past been confused with Picea abies due to the use of the same vernacular name. The word ‘Omorika’ is common in Bosnian and Serbian folklore where it symbolize slenderness (Novak 1927). Picea abies, which also can have a very slender habit, often grows with P. omorika and the word ‘Omorika’ has been applied to both species in the past. 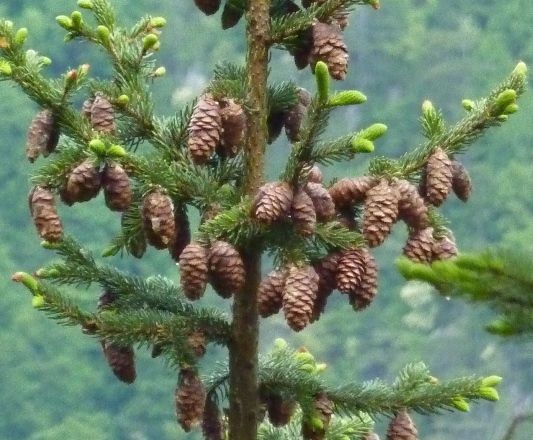 Picea omorika is endemic to Bosnia and Herzegovina and neighbouring Serbia in the Balkan Peninsula. Confined to the eastern part of the country in Republika Srpska close to the Drina River. It occurs in three regions - Region Foča (Municipalities - Višegrad, Čajniče, Foča) Region Vlasenica (Municipalties Srebrenica, Milići) and Region, Sarajevo-Romanija (Municipality - Rogatica). There are 14 confirmed sites within Republica Srpska. These are (names followed by km²/no. individuals): Višegrad Municipality: Veliki Stolac (0.3/3,000); Karaula Štula (00.1/100); Gostilja (0.258/1,000); Tovarnica (0.02/?). Čajniče Municipality : Viogor (0.1/150). Foča Municipality: Radomišlje (0.027/100). Srebrenica Municipality: Šarena Bukva (0.005/20); Strugovi (0.1/100). Milići Municipality: Crkvice–Tijesnido (0.014/100). Rogatica Municipality: Suvi Dol (0.1/2,000; Baba (0.03/1000; Panjak (0.005/20); Novo Brdo (0.005/200). These sites represent three distinct locations. The largest cluster of sites (ca 12) is in an area ca 40 x 20km² between Višegrade and Srebrenica and is contiguous with the main location in Serbia. The second is about 25km south at Viogor (Čajniče Municipality) while the third is another 60km southwest at Radomišlje (Foča Municipality). In Serbia it occurs in 11 different sites forming two distinct locations. Ten sites are in the Municipality of Bajina Bašta in the Tara National Park (Site name/no. of trees): Bilo, 4,192; Lutibreg, 319; Crvene Stene, 3,000; Studenac, 763; Pod Gorušicom, 1; Zvijezda, 50,000; Vranjak (locus classicus), 442; Karaula Štula, 374; Crveni Potok, 6; Zmajevački Potok, 797. The eleventh site is at Ravnište-Kanjon Mileševke (Municipalty of Prijepolje), about 75km from the southern most point of the main area. Here, there are about 300 individuals. Picea omorika occurs on steep north to northwest facing limestone slopes (sometimes precipitous) which overlay igneous rocks. The altitudinal limits are from 800–1,450m. Depending on the altitude and slope, the associated tree species can include Abies alba, Picea abies, Pinus nigra, Fagus sylvatica, Populus tremula, Sorbus aucuparia, S. aria, Quercus spp and Ostrya carpinifolia. Sometimes it can occur as the dominant species within the forest, and at higher altitude on rocky outcrops it is co-dominant with Pinus nigra. On steep slopes at high altitudes it is co-dominant with Picea abies and Pinus nigra while on steep slopes at lower elevations it is co–dominant with Fagus sylvatica. The sites at Bilo, Lutibreg, Crvene Stene, Studenac, Pod Gorušicom, Zvijezda, Vranjak and Karaula Štula. Most sites are on limestone. The main associated species are Picea abies, Abies alba and Fagus sylvatica. It can also occur with Pinus nigra, P. sylvestris, Carpinus betulus and Acer platanoides. Sometimes it forms almost pure stands. The Crveni Potok site is on peatland while the Zmajevački Potok site is on serpentine soils that are derived from ultramafic rocks. In Serbia it has an altitudinal range between 1,000–1,500 m, mainly on very steep north-facing slopes. Male cones mature in May. Female cones mature in September-October but mostly remain closed until the following May–June: they may persist for up to five years. Typically a good coning year is usually followed by a poor one. Post–fire regeneration is usually very good although limited to steep slopes and cliffs. The climate is characterized by very high humidity, high precipitation regularly distributed over the year, high snow cover, and low winter temperatures. Historically the inaccessibility of many of the stands has limited its utilisation, particulary in Bosnia and Herzegovina. Today seed collections are often made for commercial forestry. Picea omorika is frequently cultivated as an ornamental tree. The extent of occurrence (EOO) is estimated to be 4,076km² and Picea omorika is restricted to fewer than five locations. Recent fieldwork indicates that there is a continuing (albeit slow) decline in the extent of occurrence, area of occupancy, quality of habitat and number of mature individuals in some locations. This is primarily due to poor regeneration and an inability to compete with associated tree species. Until the middle of the 19th century the natural range of P. omorika was more continuous and less disjunct than it is today. Its current fragmented distribution is mainly the result of anthropogenic factors such as general forest clearing and cutting, pastoralism and wildfires. Picea omorika is dependent on catastrophic events for good recruitment and healthy subsequent growth to take place. Once established, it often becomes suppressed by Abies alba, Fagus sylvatica and Picea abies (Burschel 1965). This decline may become even more pronounced due to the expected climate change (Ballian 2006). Logging has never been a significant threat. It has often been stated that Picea omorika is threatened due to trees from natural stands out–pollinating with commercial plantations of Picea sitchensis, this fact should be considered as an urban myth! It’s extent of occurrence (EOO) has been calculated as being 1745km² which falls well within the 5000km² threshold for Endangered and has an area of occupancy (AOO) of 117.4km² which falls well within the 500km² for Endangered. It occurs in less than 5 locations where there is evidence that there is a continuing decline in the extent of occurrence, area of occupancy and quality of habitat. Historically fire has been the biggest threat to Picea omorika. More recently during the 1992-1993 conflict, the forest at Strugovi was deliberately burnt leaving less than 100 mature individuals alive which still stand today, but there is good regeneration across the site. However, generally speaking regeneration is extremely limited except on the steepest rocky slopes and on cliffs where broad-leaved trees are unable to compete effectively. During recent fieldwork it was noted that the isolated locality at Viogor in Čajniče Municipality had a poor quality of habitat where the old-growth trees were stressed and had thin crowns. The Extent of Occurrence (EOO) has been calculated as 399km² which falls within the 5000km² threshold for Endangered. It has only two locations, one of these is a cluster of about 10 sites all within the confines of the Tara National Park and one disjunct location about 75km south of here. There is an observed decline of the species, albeit slow, due to poor regeneration and an inability to compete with associated tree species. In Serbia the decline is slow as a direct result of poor regeneration and its lack of competitive ability. It is most evident at Mitrovac (Crveni Potok) and in the canyon of the river Milesevka, near to Prijepolje. In Serbia, all locations except one are protected within the Tara National Park. In Bosnia and Herzegovina all stands are protected by national legislation. Picea omorika is widely grown in gardens in northern Europe but few of these collections are either comprehensive or well documented. A well co-ordinated ex-situ conservation programme could play a significant role in conserving its genetic diversity. 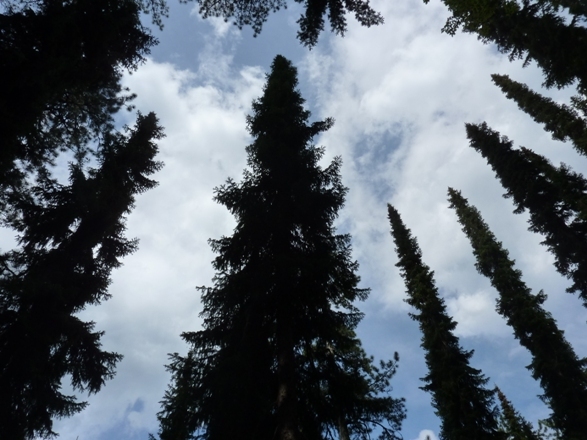 Recent collections made by the International Conifer Conservation Programme and Bedgebury Conifer Conservation Programme in collaboration within Bosnia and Herzegovina aims to broaden the genetic base of the trees grown in the UK. An extensive programme of seed-banking would also be advantageous. Ballian, D., Longauer, R., Mikić, T., Paule, L., Kajba, D. & Gömöry, D. (2006). Genetic structure of a rare European conifer, Serbian spruce (Picea omorika (Panč.) Purk.). Plant Systematics and Evolution. 260(1): 53-63. Isajev, V. (1987). Serbian spruce (Picea omorika (Pančić) Purkyne improvement on the genetic and selection bases. Unpublished PhD. Forestry faculty, Belgrade. Kuittinen H., Muona O., Kärkkäinen K. & Borzan, Ž. (1991). 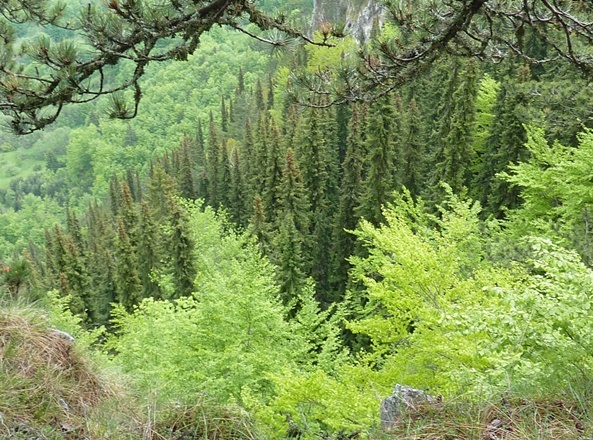 Serbian spruce, a narrow endemic, contains much genetic variation. Canadian Journal of Forestry Resources. 21: 363–367. Radović, D., Stevanović, V., Marković, D., Jovanović, S., Džukić, G. & Radović, I. (2005). Implementation of GIS technologies in assessment and protection of natural values of Tara National Park. Archives of Biological Sciences Belgrade. 57(3): 193-204. Wardle, P. (1956). Picea omorika in its natural habitat. Forestry. 29(2): 91-117. M. Mataruga,D. Isajev,M. F. Gardner,T. Christian,and D. Luscombe, 2015. Picea omorika, from the website, Threatened Conifers of The World (http://threatenedconifers.rbge.org.uk/taxa/details/96).